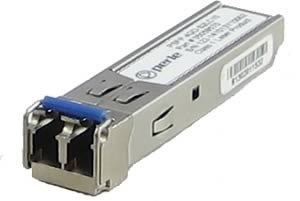 Our SFP Optical Transceivers are hot-swappable, compact media connectors that provide instant fiber connectivity for your networking gear. They are a cost effective way to connect a single network device to a wide variety of fiber cable distances and types. By eliminating the need to maintain surplus units/ devices of various fiber types for network repairs or upgrades Small Form Pluggable Optical Transceivers reduce network equipment inventories. SFPs allow one product the flexibility to expand by speed (Fast Ethernet and 1, 10, or 40 Gigabit), and/or distance (220 m to 80 km). Network upgrades are also made easier because SFPs are interchangeable fiber connectors that can adapt to any existing network. For example, by simply replacing the pluggable optical transceiver, a media converter that was originally used in a multimode network can be re-configured to operate over a CWDM network. Our SFP Optical Transceivers can be used and interchanged on a wide variety of Cisco or MSA compliant SFP products. They can be intermixed in combinations of 1000BASE-SX, 1000BASE-LX/LH, 1000BASE-EX, 1000BASE-ZX, or 1000BASE-BX10-D/U on a port-by-port basis. Our SFP Optical Transceivers are designed for use with Our SFP Media Converters, Industrial Ethernet Switches and third party equipment that supports SFP transceivers. Contact us for details on Duplex, Simplex( BiDi ), CWDM or 10 Gigabit SFP+ and XFP Models.